The Australian National Anthem playing in Greenland. Yes. Much to everyone’s surprise, Phillip Bellingham (a fellow Aussie from Victoria) beat local legend Martin Møller to the finish line of the 2019 Arctic Circle Race by a mere 3 minutes and 18 seconds. This 160km, 3-day event near Sisimiut is widely renowned as the toughest ski race in the world. Greenlander Martin Møller has won it for the past several years and it was a very close race to be beaten by such a short margin over this distance! Phillip explains his strategy for the race at breakfast on Day 2. And it proved to be a good plan, as the deciding factor ended up being a sprint to the finish line between Phillip and Martin. One of the reasons the Arctic Circle Race is so tough is because Sisimiut is surrounded by very mountainous terrain. Another is because participants have to camp out with minimal equipment for 2 nights, preparing their own food and taking care of themselves. You need a strong mental attitude to be able to cope with this on top of a grueling day on skis in cold temperatures! Unfortunately I wasn’t in Sisimiut to see the race for myself. However, I do know the terrain around Greenland’s second largest city as I spent over a week there last year hiking and exploring the area during the Summer. It is a spectacularly beautiful part of the world as the following drone footage courtesy of Mads Fridolin Vejlby shows. Are you coming back next year to defend your title? I have a large number of blog posts about Greenland, so feel free to read more about my experiences here on my blog. This post contains some affiliate links. If you make a purchase through one of these links, I will earn a small commission at no extra cost to you. Your support is appreciated! Abandoned in the 1960s as part of the Danish government’s G60 program, the small settlement of Qoornoq has found a new lease on life as a Summer getaway for the families of its former residents. Exploring this small village on a boat tour from Nuuk offers a wonderful 1/2-day trip into the Nuuk Fjord from Greenland’s capital. The weather was not looking brilliant as we rounded the 3 sides of Nuuk to start our journey up the Nuuk Fjord to Qoornoq. 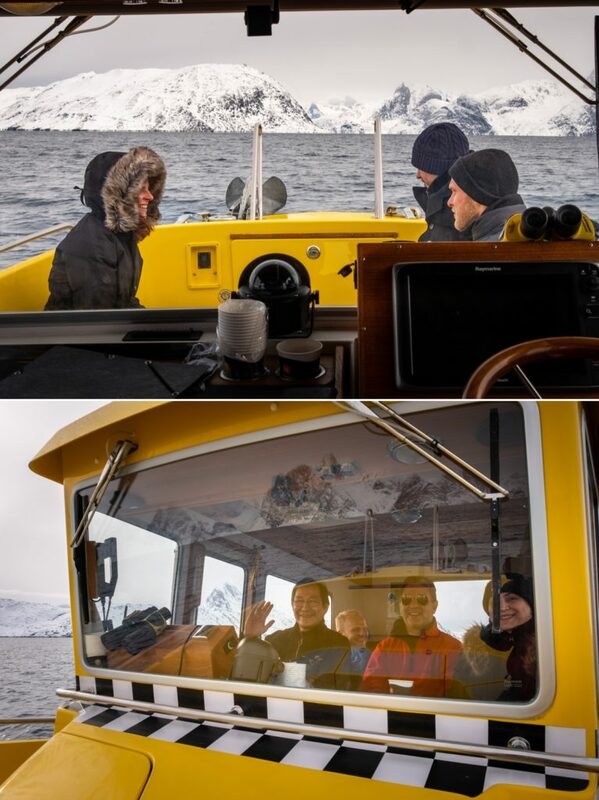 And although some of my travelling companions decided to brave the cold for a brief period, we spent most of the journey inside the warm cabin of our Nuuk Water Taxi, chatting and watching the spectacular scenery slide by through the large windows. Fortunately the clouds were high enough that we could still see the peaks of most of the mountains, and the overcast day created a more subdued feeling than the bright sunshine I enjoyed on my first trip up the Nuuk Fjord. Perfect really for exploring an abandoned settlement. It took us about an hour to make our way up the fjord, and it turns out Sermitsiaq is not the only mountain with a frozen waterfall! Our first view of Qoornoq was a string of brightly coloured houses spread out over a peninsula. and our landing point was around the back at a set of wooden stairs. Our captain, Thue, dropped us off and said to be back in an hour … then headed off to go fishing for his dinner. This early in the season (mid-March), there is nobody at Qoornoq. In fact, I was asked later in the week by a person who owns a home there about how much ice there was and where we had made our landing. It was absolutely silent as we headed our separate ways to explore this hibernating village, footsteps muffled by the sometimes quite deep snow that covered the ground. but all were locked up for the winter. The cemetery was a poignant reminder that there used to be a permanent community here. People who hunted and fished and lived out their lives in this remote place. It was very easy to imagine that they left only yesterday. and other evidence that this small village comes alive during the summer months. It was a strange feeling to be wandering around a well maintained settlement with not another soul in sight. Almost like I’d only just missed the zombie apocalypse! Unfortunately, an hour is nowhere near long enough to fully explore Qoornoq and I didn’t manage to get down to the fish processing plant, nor discover the remnants of the abandoned railways that used to transport fish wagons. Clearly I’m going to have to return for another visit, and also spend some time searching for the Norse and ancient Inuit archaeological ruins that are meant to be in the area. When we returned to our boat, we were all very impressed by Thue’s fishing haul. So we stopped off for 15 minutes on the way back to Nuuk to try our own luck. Cod fishing in Nuuk Fjord is so ridiculously easy! You simply drop an unbaited line overboard, and within minutes (sometimes seconds) you have a sizable fish! This was my second experience of cod fishing (when I went around Sermitsiaq a few weeks ago we also dropped lines in) and it is crazy how quickly you can catch your dinner! On the return journey to Nuuk, Thue took us quite close to mountains that towered above us and dropped more than 1000m straight into the Fjord. It is an immense and rugged wilderness surrounding Greenland’s capital city and I can’t wait for my next chance to explore it further. If you are heading to Nuuk as part of your trip to Greenland, make sure that to head out on one of the many fjord tours available. There are actually several small settlements in the Nuuk Fjord (not just Qoornoq), so take your pick of whichever one interests you the most and go exploring. A Nuuk Fjord boat tour is a must-do for every visitor to Greenland’s capital city. Even a relatively short trip of a few hours takes you past incredible mountain scenery and may even provide you with dinner! There is something really special about being out on the water. I’m not sure what it is, but I am always keen to jump on a boat and set sail – no matter where we may be heading. Which is how I found myself at “Tidevandstrappen” (the Tidewater stairs at Nuuk’s industrial harbour) at 8:45am for a 4 hour Nuuk Fjord boat tour. I would be sharing this trip with a solo traveller from the US and a group of 8 people from Nunavut – Canada’s newest territory. This was a fantastic group and we had a lot fun together on our fjord adventure. We were welcomed on board by our captain, Katarina, and given a briefing on where we would be sailing by our guide, Sebastian, as we headed out into the fjord past the colourful houses of Nuuk. Some of the hardy folk from Nunavut elected to sit out on the front deck to enjoy the bracing temperature and wind-chill of Greenland, but I stayed in the warm comfort of the cabin for this first part of the trip! On this trip, we would be exploring the part of the fjord that is closest to Nuuk. In particular, we would be circumnavigating Sermitsiaq mountain, the icon of Nuuk, which forms its own island very close to the capital. Before we did that, however, Katarina set course for Maaluto island, where Nuuk Fjord’s 5 whales are sometimes seen. Unfortunately, there were no whales on this occasion, but my imagination ran wild with the thought of owning one of the summer houses in this beautiful area. How amazing would that be?! I would love a place like this! We also found a small iceberg, and I was fascinated by how excited the folk from Nunavut were to see one. Apparently they have a lot of sea ice there in the winter, but not so much old ice like this that has come from a glacier. The next major stop on our tour of the Nuuk Fjord was the waterfall that cascades over the back of Sermitsiaq. At this time of year (the start of March), it is frozen solid, and forms the most beautiful and colourful “stalactites”. We watched in amazement as Katarina nosed the boat into the rocks at the base of the waterfall and Sebastian jumped out (in tennis shoes!) to gather ice from the waterfall for us. Given how much trouble I have just walking around Nuuk on the ice, it was an impressive display of mountain-goating! Sebastian doing his best mountain-goat-on-ice impression. It was seriously impressive to watch! Our reward – ice that doesn’t get much purer than this. The mountains around Nuuk are spectacular – and not just Sermitsiaq! and what better way to take some time out and enjoy the scenery than to do a spot of fishing! Sebastian and Katarina set us up with a couple of hand-lines, each of which contained 3 large hooks. No bait. Just 3 hooks on a line. And within 30 seconds of dropping these unbaited hooks over the side, we had our first fish! Plenty of fish down there! and again (and unlike in Australia) the fish were biting at nothing. Several of us even managed to pull up 2 fish at a time! This was my first experience of using a hand-line. And although it is very easy to spool out the line, it really is a 2-person job to bring it all back in – one to pull on the line itself, and the other to wind the line back onto the rack so it doesn’t end up in a tangled mess on the floor. One person to pull the line in. One person to wrap it back around the spool. We’d caught about 20 fish and were very proud of our seafood haul before we decided to call it quits and head back towards Nuuk. After so much bracing fresh air and excitement, we spent most of this return journey inside the warm cabin, drinking tea and coffee and admiring the views through the large windows. It was nice and warm inside and we still had great views. The bonus was tea and coffee! The entrance to Nuuk harbour is on the opposite side of the city to the main fjord, which means we had a wonderful opportunity to see the Old Colonial Harbour and the colourful houses that contribute to the moniker – “Colourful Nuuk” from the water. If Nuuk is part of your itinerary for Greenland, you have to head out on one of the many fjord tours available. Even a short one such as this is an amazing experience and offers really beautiful views from the water. Taking a helicopter scenic flight over the Nuuk Fjord is one of the highlights of a visit to Greenland’s capital. But did you know you can make your flightseeing experience even more awesome by landing near the summit of one of the highest mountains in the area? I LOVE helicopter scenic flights! With air travel so common these days, there is something exotic about being in a helicopter. So you can imagine that I jumped at the chance to take a flight over Nuuk and the Nuuk Fjord system when the opportunity arose. The added bonus – we would actually land near the summit of one of the tall peaks near the capital! There were 5 of us on this adventure to the high wilderness around Nuuk. Our pilot, Jonas, met us at Nuuk airport and led us out to our waiting aircraft. There he pointed out all the safety features of the aircraft as well as the things not to step on or touch … good to know! Preparing to take off. Very important to know what you can and cannot touch! The 5 of us bundled into the small AS 350 Eurocopter without disturbing anything we shouldn’t. It was a bit of a tight squeeze in the back with 4 of us rugged up in heavy duty puffy jackets and ski pants, but we jigsawed ourselves until we were all clipped in and sat back to enjoy the ride. On the Helicopter Summit Flight the pilot has a choice of two mountains – Kingittorsuaq (one of the “deer antlers”), or Sermitsiaq – Nuuk’s iconic neighbour. The destination for the day depends on weather conditions, but I have to admit I was really excited to learn that we would be heading for Sermitsiaq. It is a very short flight that had all of us sweeping our heads back and forth trying to take in the spectacular views in every direction. One of the many great things about a helicopter flightseeing tour is that the windows tend to be larger than in a plane, allowing you to see much more – even if you are in the middle seat like I was. After passing by the western edge of the mountain, Jonas started searching for an appropriate place to set the helicopter down. He decided upon a small, relatively flat area below the summit and used the helicopter itself to ensure our landing spot was secure. As we came in the first time, the rotors blew some of the snow out of the way. He then “landed” using the helicopter skids to compact the snow, and then lifted off and backed up to see exactly what his chosen landing place looked like. He repeated this three times before he was satisfied and we made the final landing. I have to admit the adrenaline was pumping while all this was going on! We only had a short time on the mountain, so Jonas helped us make the most of it by leading the way to the best viewpoints. and grand views back towards the helicopter and summit of Sermitsiaq, which reminded us just how small we are in this world. It is amazing how quickly 25 minutes passes when you are in such a location, and all too soon it was time to head back to the helicopter for our return to Nuuk. Rather than heading straight back to the airport, the scenic flight takes you on a full circle around the city so that you can see it from all angles. It was so interesting to see how spread out Greenland’s capital is, and I loved how the houses added a dash of colour to the blue-grey and white landscape. No matter the angle, there is no denying that Nuuk is located in a truly spectacular place. Then, an hour after we took off, Jonas had us lined up along the runway for our approach into Nuuk airport. He set the helicopter down onto its small wooden towing platform with barely a bump – such is the skill of Air Greenland pilots. This was by far the best scenic flight I’ve ever done anywhere in the world! The opportunity to do a wilderness landing high up on a mountainside is a unique experience, and the views from near the top of Sermitsiaq are truly stunning. There are several flightseeing tours available from Nuuk and in other places in Greenland, but if you are looking for something more than just your typical scenic flight – I highly recommend the Helicopter Summit Flight from Nuuk. And just because I love it – here is a 270 degree panorama from the our wilderness landing on Sermitsiaq. Million thanks to Air Greenland for this incredible flightseeing experience! exploring the Government tourism site at Visit Greenland. My travel schedule for 2019 is very much centred on Greenland. Those of you who have chatted to me in the past 18 months know how obsessed I am with the place, so I was very excited to be able to collaborate with Guide to Greenland for this trip. I actually started blogging for them after my first trip here in 2017 and you should definitely check out that blog for more stories from Greenland from yours truly! My apartment is up on a hill in the suburb of Qarsaalik – out near the University and the airport. While this might sound like a million miles away from the city centre, given how small Nuuk is (it only has a population of 18,000 people), it means I have about a 3km walk to get to town. On my first morning, I headed out from home at 7:30am … well before the Sun had risen. Rather than walk down the road (which initially heads in the wrong direction), I followed some locals straight down the steep snowy slope that passes behind the Recycling Centre and ends near a part of Nuuk Harbour. Fortunately it wasn’t too slippery, and I managed to make it down without falling! Still testing out my snow legs! I asked Maps.Me to show me the best way to walk into town, and set off following its trail of blue dashes. This led me along a convoluted route between apartment buildings that were absolutely silent in a world muted by snow. I’d never really experienced something like this before, and I was surprised at how much a thick layer of snow changes the soundscape. The centre of Nuuk is relatively flat, and when I visited here 2 years ago I didn’t really venture too far beyond that. However, walking in from the suburbs quickly had me reassessing my view of Nuuk – it is quite a hilly place and there are staircases everywhere! My route into town led me up and down several staircases, with this 240-stair monster providing an incredible view over the harbour. Looking carefully at the end of the straight road heading through the above panorama, you can see the next staircase I was heading towards leading up the snowy bank to a passing bus. This is the last staircase on my walk into town (which is just behind the hill), and there is another amazing view back down over the harbour from the top. The offices of Guide to Greenland are very close to the center of town and really lovely inside. Eeeeek! A Mac! And I swore I’d never use one again… I do very much like what is keeping me company on the windowsill though! I had a great day getting my bearings and chatting with everyone, and am really looking forward to my time collaborating with this awesome bunch of people! Then, about 4pm, it was time for the walk home. Yes, the days are quite short at the minute, and that 240-stair staircase gives you quite a workout when you are heading up it! Oh boy! The start of the 240 stairs leading up. It was much easier coming down! It was quite dark by the time I’d reached the bottom of the snowy slope below my apartment, but I’d forgotten (didn’t think to bring) my headlamp. So time for the phone to guide the way! Walking in snow in the dark is challenging. You can’t quite make out the lay of the land … hence flashlight! It’s always nice to arrive home, as Greenlandic houses are very well heated. You strip off in a “mud room” just inside the door before venturing further into the house. I love where I’m staying – here’s a nice little tour of the inside. Yes, it is small – and the kitchen is challenging for someone who loves to cook (even though I have almost everything I need). But it is perfect for my stay here this time and I love it! It’s a bloody long way from Australia to pretty much anywhere! I was flying to Copenhagen on my birthday to start my 2019 adventures. This year they are primarily focused around one country. You might be able to guess which one if you’ve been keeping up with the blog posts and my obsessions, otherwise the home-made board game and birthday gift “Sah’s 40-something Travel Quiz – 2019 Edition” might give you a clue. Playing the latest edition of my awesome board game! One of the many brilliant things about this game is that the questions are specifically written for each person. Which means a 4 year old has as much chance of winning as a trivia buff! Copenhagen is one of the two stepping stone options you have to get to Greenland. Previously, I’d always flown from Reykjavik in Iceland, but I’d never been to Denmark and it was a good opportunity to visit the Visit Greenland offices (I’d worked with them on their upcoming “Ultimate Guide to the Arctic Circle Trail” page last year), and catch up with a friend I’d not seen in 18 years! The Visit Greenland offices are in an awesome building that also hosts representatives from Iceland and Faroe Islands. There is a very cool Greenland store and museum there as well. I didn’t have a lot of time in Copenhagen, and Enzo and I spent the vast majority of it chatting. 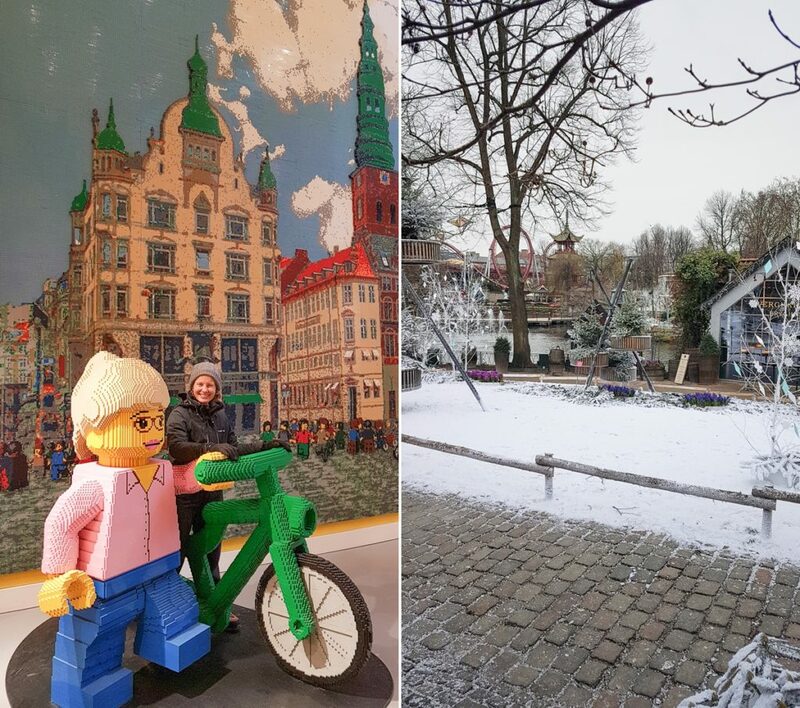 But we did manage to make it to the Lego shop (very cool), to watch Russ’ last IMAX Movie “The Story of Earth” at the Tycho Brahe Planetarium, and teach me that Tivoli is much more than just a venue that my favourite band, Nanook, play most years. 48 hours after arriving, I was back at CPH (Copenhagen airport) and boarding Norsaq – Air Greenland’s only jet – for the 5 hour journey to Kangerlussuaq – Greenland’s primary international airport. Flying over Denmark, Norway and Iceland. Which had turned to grey skies and snowy landscapes as we came in to land at Kangerlussuaq. This looked VERY different to when I was here last August to hike the Arctic Circle Trail! It was -16 degrees C when we landed and the walk from the plane to the terminal was my first taste of walking in icy/slippery conditions. Fortunately I didn’t face plant! This is the biggest airport in Greenland. No, there are no aerobridges. One of the many interesting things about Kangerlussuaq airport is that although it is the primary international airport for Greenland (due to having the best weather and the longest runway), nobody actually stays there. When Norsaq lands, there is a fleet of at least 4 Dash-8 planes waiting to transfer passengers to where they actually want to go in Greenland – in this case Ilulissat, Sisimiut, Narsarsuaq and Nuuk, my final destination for this trip. Looking out the window of Kangerlussuaq airport. Note the several Dash-8 planes waiting (one had already taken off). Yes, the announcement is in Greenlandic, but there was an English version that followed. Less than 2 hours later, Norsaq took off again in the direction of Copenhagen, I’d taken a picture of Kangerlussuaq’s famous sign, and I had boarded my own Dash 8 to head to Nuuk. Despite having mostly lost my voice, I spent the entire flight chatting with the person beside me. This was my second trip to Nuuk, and when it came into view 40 minutes later, I was reminded about how stunning the surrounding landscape is! I’m soooooooo excited about my time here! My plan upon arriving in Sisimiut after trekking the 160km Arctic Circle Trail from Kangerlussuaq, was to spend several more days in town doing day-hikes around the area. I found .gpx trails for several hikes at Destination Arctic Circle (thanks guys!) and was super-keen to do the “UFO Hike” in particular. After all, what exactly would I find at the end of a “UFO Hike”?? As with the hike to the summit of Nasaasaaq mountain, the first 3.5km of this trail follows a dirt road out of town. Fortunately it is a different dirt road to the one that leads to Nasaasaaq and the Arctic Circle Trail (which I’d already seen 3 times by now), and there is a period of interest when it leads you right through the middle of “Dog Town”. This is the area on the outskirts of Sisimiut where the majority of town’s Greenlandic Sled Dogs are chained awaiting the winter months. I grumbled to Tyson about hiking along roads (it’s definitely not my favourite thing) as we made our way to its end and the start of the trail. The narrow track we followed through the wilderness led us slowly upward, and my complaining stopped completely when we crested the first ridge and had a clear view of the valley we’d be hiking through. The landscape in front of us was absolutely stunning! Our hope was to find a physical trail at the bottom of the valley that would coincide with the .gpx trail I had downloaded (the ridge trail was off by about 500m). But alas, there was no trail to be found. This is not the easiest thing to do when your boots have sunk so far into the spongy moss that they have all but disappeared (I actually ended up face-first a couple of times after stepping in hidden holes). Nor is it easy when, having made it through the moss, you are then confronted with a hip-high wall of Arctic Willow! 2km later and wringing wet (the dew-laden Arctic Willow saturated me within 5 steps) it was a relief to finally recover the trail and exit this “uncharted” section of the hike. The trail became more obvious (and much dryer!) as we started to climb. Then – a sudden surprise! A beautiful lake with almost perfect reflections! Given that this relatively large body of water didn’t appear on Maps.Me (the offline map app of choice for both Tyson and myself), we decided to name it “Hidden Lake” as we hiked around its edge. A second lake appeared after the first, and both the views in the direction we were heading and back down over the lakes became more and more stunning as we crested several false passes. Eventually, we arrived at the actual pass and could see our final destination – still about 3km distant. Can you see the UFO on the right-hand part of the hill in the mid-ground? Crossing this final stretch towards Sisimiut’s UFO was a bit of a surreal experience. How cool is it to have a back-country hut in the shape of a UFO?! We climbed the ladder into the heart of the ship to check out the inside. There was no lock, just a circular disk of plywood covering the access hatch, and nothing inside either. It was a great place to escape the cool breeze that had sprung up and have lunch, but I imagine it would be extremely noisy, and the structure would move quite a bit if you had more than about 4 people in there! It is an actual Hut that you can stay at, and our friend Aqqalooraq, who works reception at the Hotel Sisimiut, told us he’d been there several years ago on a school excursion. One thing about Sisimiut’s aliens – they picked an amazingly beautiful spot to land! Well … actually, they didn’t initially. The hike back to Sisimiut was along the same route as we took to get out to the UFO. It really is a very, very beautiful hike, and I entertained myself with a game of “could this be evidence of alien life?” as we made the return trip. When we got back to the “uncharted” part of the hike, we did another search for a trail (the last thing we wanted to do was bush-bash through again), but there was nothing visible from this direction either. We suspect the trail has simply been overgrown. Let me know if you find it! Just before we reached the end of the trail where it rejoins the road, we started to come across lots of locals picking crowberries. It was a Sunday afternoon and whole families were out with buckets collecting these slightly tart berries to turn into desserts for the week. The hike out to the UFO Hut from Sisimiut is not technically challenging (unless you count the bush-bashing part) but it is long. The reward is hiking through an incredibly beautiful valley, and the surreal experience of being able to climb into a UFO at the end of it! I loved this hike! I have a large number of blog posts about Greenland, so feel free to read more about my experiences and hiking adventures here on my blog. The most popular day-hike from Sisimiut is the climb up Palasip Qaqqaa – the 544m mountain that overlooks the airport. However, Tyson and I aren’t really ones to follow the crowds, and so on the first clear day after arriving in Sisimiut, we decided to tackle the pyramid-shaped Nasaasaaq Mountain (784m) instead. We picked up the trail notes for the “Hard Route” (of course!) from the foyer of the Hotel Sisimiut and headed along the extremely boring 2km of road past the lakes that provide the town with drinking water. We had already hiked this section of road a few days earlier when we arrived in Sisimiut after 8 days on the Arctic Circle Trail. It wasn’t interesting then, and was even less so now! But as soon as we left the road and started trying to follow the trail notes, things became very interesting indeed! and figured that the steep gully to our left looked about right. The added bonus was a fairly well defined track that we followed for most of the way up, and the occasional small stone cairn with blue paint on it. before turning right along a very faint trail leading off to what looked to be a cairn in the distance. Hmmm… Is this right? It was what the trail notes said to do, but it didn’t inspire confidence that our “superhighway” trail suddenly became barely visible. We persevered, however, and eventually arrived at the structure I had seen from the pass. It was indeed a cairn, and it even had blue paint on it! Thank goodness this thing that I’d seen in the distance turned out to be a cairn! Fortunately, we encountered several other cairns, which ultimately led us along the upper flank of the mountain. Meanwhile, Tyson did his best to ignore the very steep drop-off to our right (fortunately dodgy heights don’t worry me too much)! Cliff on one side, steep drop on the other. There was only one way forward. Eventually, the trail turned upwards and we played “spot the blue spot” as we ascended through the rocks to the saddle point mentioned in the trail notes. It did exist! Despite us long having given up hope of ever finding it. Now that we’d managed to make it onto the ridge, we decided to first of all head over to our right to explore the rocky bluff in that direction. and the alpine peaks along the Arctic Circle to the South of the city. After taking in the views for a while, it was time to turn around and head for the main event. The closer we got to the final ascent, the more daunting it looked. Note the two hikers at the base of the slope! which has ropes to help you up/down otherwise impassable obstacles. Thank goodness for the ropes! In the end, the 360-degree panoramic reward was totally worth the effort and nerves – especially on a day like this with clear views and no wind. Unfortunately, the light was not the best for photography 🙁 If I ever get another opportunity, I will camp at the saddle and climb the peak twice – once in the evening for the views over the Amerloq fjord and the abandoned settlement of Assaqutaq, and again in the morning for views over the valley through which the Arctic Circle Trail runs. The Amerloq Fjord as seen from the summit of Nasaasaaq mountain. Can you spot the abandoned settlement of Assaqutaq on the island at bottom-right? After about an hour at the top, we very carefully made our way back to the saddle and decided to follow the “Medium-hard Route” back to Sisimiut. This trail led us down towards the valley with the Arctic Circle Trail, and there we discovered where we’d gone wrong on the way up. The “Medium-hard Route” is another obvious track that turns off from the Arctic Circle Trail rather than ascending up the gully. If you are hiking the Arctic Circle Trail, have time, and the weather is reasonable, I’d recommend taking this trail at the end of the hike and spending an extra night camping at the saddle of Nasaasaaq. This would allow you to climb the mountain on the way into town, rather than doing it as a day hike afterwards. Look for the cairn with both red (indicating the Arctic Circle Trail) and blue (indicating the Nasaasaaq trail) paint on it, and a trail leading off to your left as you approach Sisimiut. The hike to the summit of Nasaasaaq mountain is truly spectacular and a little challenging – even if you don’t take the “Super-hard-core Route”. Working my way through the folder of activities at the Hotel Sisimiut, I came across a single A4 page offering the opportunity to “create your own memories” by making your own Greenlandic souvenir. I was super excited, because I love to make things for myself (e.g. jewelry in Nicaragua and El Salvador, a bookmark in Guatemala) but it can be quite challenging to find small workshops like this. and explained that each of the materials was labeled with a price. I simply had to note down how many of what materials I used on the form and then pay at the restaurant after I was finished. The labels are all in Danish but that doesn’t really matter. They also include the prices. I’m not very good starting with a blank slate, so I studied the samples on the ideas board for inspiration. I put on Ataasiusutut Misigissuseq (the latest album from my favourite band, Nanook, who are also from Greenland) for further inspiration, and after deliberating and pondering and studying one of the pieces from the ideas board to see how knots had been used – I had my plan. It also helped that I found a glue gun! So much so, in fact, that I went around the hotel showing it off to all the staff I’d gotten to know so well over the previous week. I also showed it to several guests I’d been chatting with who asked “where did you make that?” It pays to read the folder of activities at the hotel thoroughly! If you like to make things, this cool workshop offered by the Hotel Sisimiut is an awesome way to spend a few hours. The materials available are an interesting mix that challenges your creativity, and the workspace is really beautiful. Cost: You pay for the materials you use so it all depends on what you create  No individual item is very expensive and you can use as much or as little as you wish. To give you an idea, my masterpiece cost a grand total of 13DKK or USD$2. Time: As long as you want. For me, they just unlocked the cupboard and left me with it. I talk a lot about the beauty of Greenlandic rocks in my blog posts. I also keep bemoaning the fact that I didn’t end up studying geology at university (it was either that or astronomy – I chose astronomy) and that I’m not wandering around Greenland with a geologist by my side. So it should come as no surprise that I had to go check out the rock and mineral collection while in Sisimiut! Housed in the foyer of the local technical college, KTI (Kalaallit Nunaanni Teknikkimik Ilinniarfik – Greenlandic is an amazing language), this is the largest collection of minerals in Greenland. and has expanded significantly since its inception. The 21 display cases now include minerals from all over the world, and there are also 12 low pillars showcasing large rock samples. and another to meteorite fragments. Please tell me Australia didn’t name a meteorite after a chocolate maker!! There is also a special display case set into the wall that shows the fluorescence of several minerals. Given my lack of success in finding Tugtupit while clambouring all over Kvanefjeld in South Greenland last year, I was particularly fascinated by the large sample of this rare mineral on display here. And equally amazed at the sheer number and diversity of minerals that can be found in Greenland. No wonder the mining companies are trying to get in! So this is what Tugtupit looks like! The collection is very, very well done with everything labelled (in Danish) and carefully arranged in well-lit display cabinets. If you are rock/mineral enthusiast, I have no doubt you could spend a couple of hours here. And even if you only have a passing interest, you’ll still find a short visit worthwhile. I might be biased, but I really enjoyed this collection. To find it – enter the main door of KTI (yes, it will feel weird walking into a school but go with it) and veer around to your right. You can’t miss it. Keep in mind that because it is part of a school, it is only open during school hours 🙂 And you’ll have students looking at you wondering why you are so interested in rocks! I have a large number of blog posts about Greenland, so feel free to read more about my experiences and adventures here on my blog.